Direct costs for the period increased 28%, closing at $70.85 million, up from $55.40 million reported the prior year, while for the quarter there was a 33% increase closing at $24.37 million (2017: $18.33 million). As such, gross profit for the nine months amounted to $149.07 million, a growth of 20% when compared to $123.89 million recorded last year. Gross profit for the third quarter rose 15% from $53.88 million to $46.95 million for the corresponding period in 2017. Administrative expenses climbed by 45% for the period, to total $86.30 million (2017: $59.65 million). Depreciation and amortization also increased by 24% to total $25.92 million relative to the $20.93 booked in 2017. This resulted in profit from operations of $36.85 million, a 15% decrease relative to $43.32 million booked a year ago. Finance Cost for the nine months totalled $14.24 million, a significant increase of 157% when compared to the $5.55 million recorded for the same period last year. Profit before tax totalled $22.61 million compared to $37.77 million recorded last year, a 40% reduction year over year. The company booked income tax for the period of $3.98 million (2017: $4.80 million). Earnings per share (EPS) for the period totaled $0.05 (2017: $0.09). EPS for the third quarter amounted to $0.02 (2017: $0.05). The twelve-month trailing EPS is $0.09. The number of shares used in our calculations amounted to 353,400,000 units. 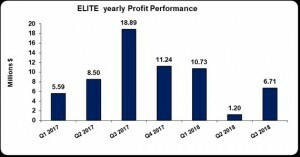 ELITE’s stock price closed the trading period on May 16, 2018, at $3.23. As at March 31, 2018, total assets amounted to $583.27 million, up $326.79 million from the balance of $256.48 million as at March 31, 2017. The increase in total assets was as a result of the increase in property, plant and equipment from $177.59 million to $434.26 million and ‘Cash and cash equivalents’ which amounted to $137.37 million (2017:$70.77 million) a 94% uptick. Shareholders’ Equity of $377.82 million was reported (2017: $212.29 million) which resulted in a book value per share of $1.07 (2017: $0.60).